The jar is very heavily potted, the bulging body tapering to an unusually thick, tall foot, and a low, wide neck with prominent rim flange. On the outside, the piece is covered with a white slip and painted in brown with a pair of phoenixes in flight, enclosed in barbed panels with hatched lines between, the birds with details engraved through the brown pigment to appear in white. 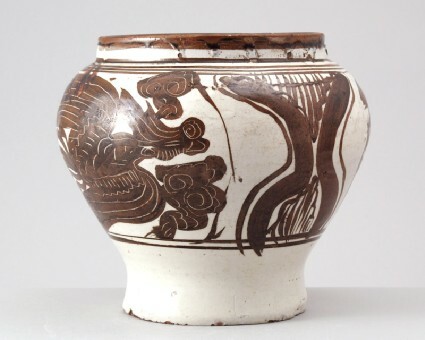 The lowest part of the jar is plain white, the rim and inside are glazed in brown. Inside the jar is a ring of spur marks, where another piece had been placed during firing. The unglazed footring and base show a dark brown biscuit.